14-year-old Orlando boy is being hailed a hero by the police department and the city after he saved his baby sister from choking. Orlando Mayor Buddy Dyer and Orlando Police Chief John Mina honored Joel Flores, 14, during a ceremony Monday. 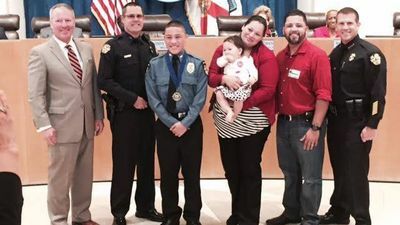 Joel, who is part of the Orlando Police Explorer program, jumped into action when his 11-month-old sister, Jordyn-Grace, started choking on food, Mina said. The infant’s parents frantically tried to help, but the child was turning blue and was becoming unconscious. Joel came in and said, “Give her to me. I know what to do,” and was able to dislodge the food the baby was choking on thanks to his training in the Explorer program. Paramedics arrived and checked out the baby, whose vitals were good. Mina said the entire family has signed up for CPR training. Joel aspires to be a police officer one day.